Over the weekend I came across a news cast about a house fire in Stillwater, NY that most likely could have been prevented. I am often asked during a home inspection if a level 2 (a.k.a. chimney sweep) is "really necessary." The answer is YES and highly recommended yearly prior to starting a fire in your fireplace or any other solid fuel burning appliance. A home inspection includes what's considered a level 1 fireplace and chimney inspection. A level 1 inspection is a visual inspection of the fireplace, chimney and as many visual components as possible. The inspection is looking for obvious defects such as cracks in the chimney assembly, firebox, faulty dampers and missing components such as a spark arrestor. Mostly an exterior evaluation. However, this inspection does not look up through the chimney interior and inspect the flue liner. A chimney sweep inspection will determine the condition of the flue liner and identify immediate safety concerns. The chimney sweep service will clean the flue liner and visually inspect the inside of the chimney assembly by use of a camera. Some people ask if it is still important to conduct a chimney sweep if the house is brand new. Of course, you should always conduct a chimney sweep prior to starting a fire in your brand new fireplace. Even a new fireplace can have a construction or quality of work defect. A chimney sweep should be conducted every year prior to starting a fire in any fireplace, especially if it is your primary source of heat. Creosote, a by product of burning wood, can buildup in the chimney and reignite. Chimney fires can quickly heat an attic space and spread throughout an entire house. 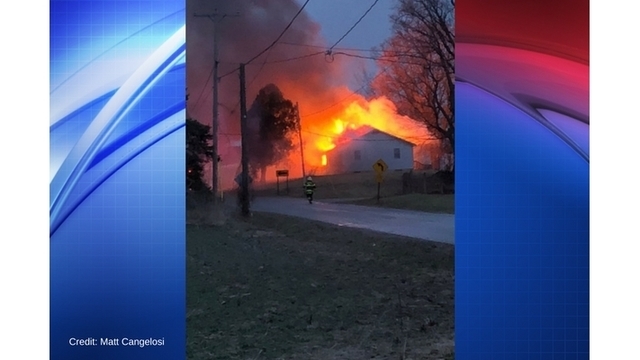 Unfortunately for the home in Stillwater, NY, not only did the homeowners lose their home, but the family dog was also lost. Fireplaces should be taken seriously, get your chimney inspected yearly! Bald Eagle Inspection Services, LLC is a home inspection company providing service, including level 1 fireplace inspections, in the Albany, Saratoga and Rensselaer County areas and beyond. If you or someone you know requires a home inspection, please visit http://www.baldeagle.biz/home-inspection or call (518) 488-2538. Zinsser Mold Killing Primer, Did you read the label?